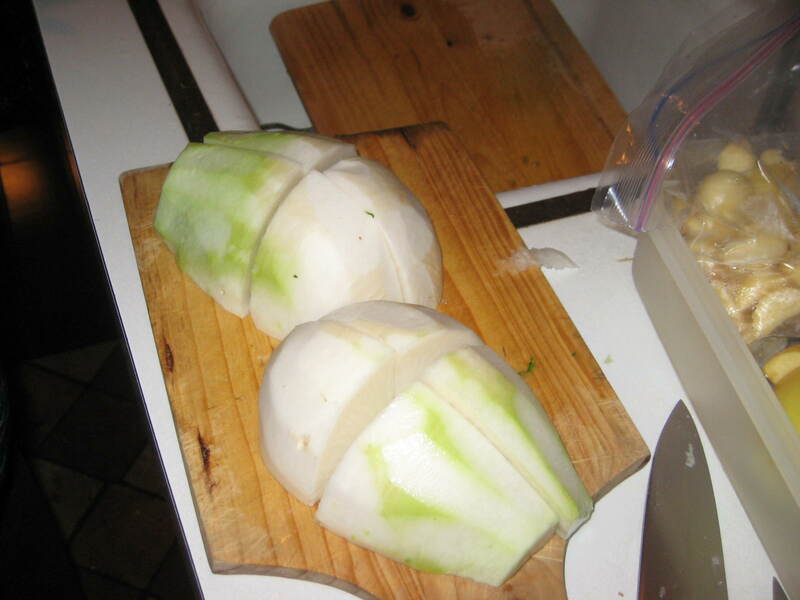 Dongchimi is a mild form of kimchi made from giant white radishes (pictured below) pickled in a briny, watery broth. 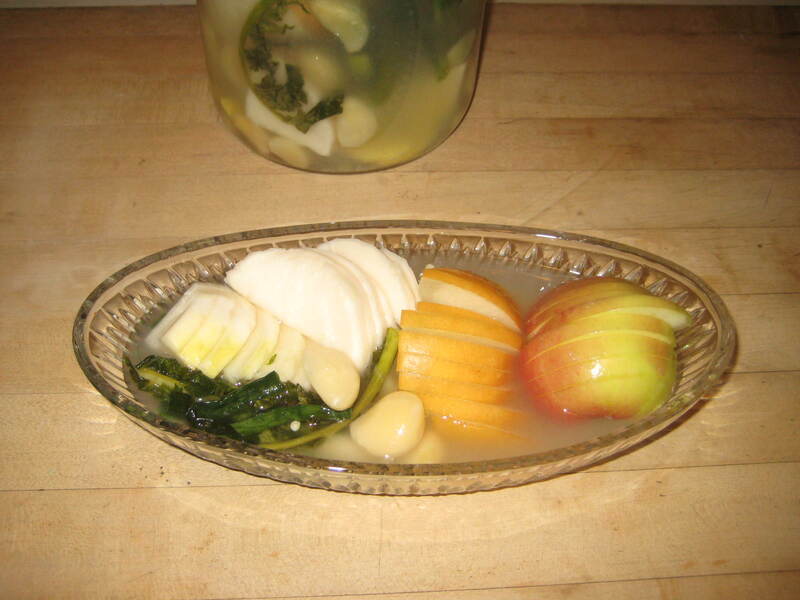 I just discovered on Wikipedia that the northern regions of Korea are known for dongchimi, which is traditionally made in the winter when white radishes are in season. 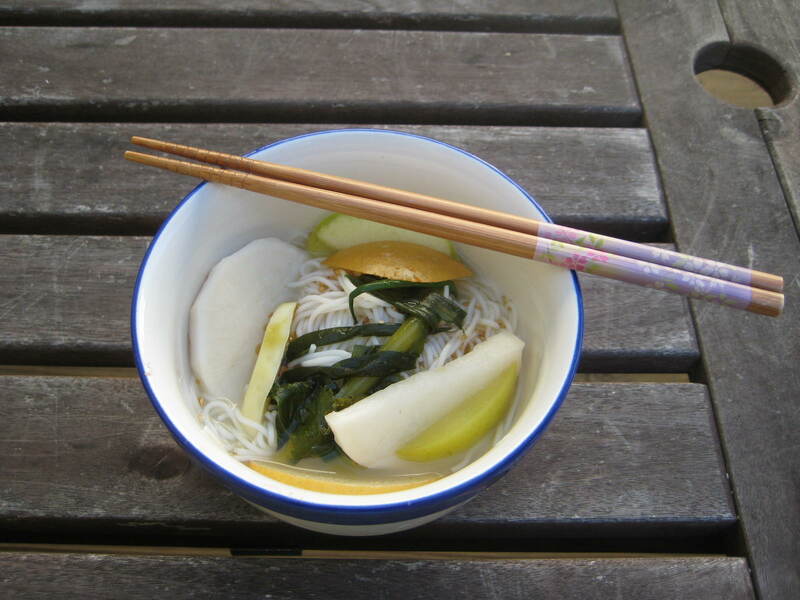 Dongchimi guksu tastes like childhood to me. My mother in particular loves it, which makes sense given her northern roots. 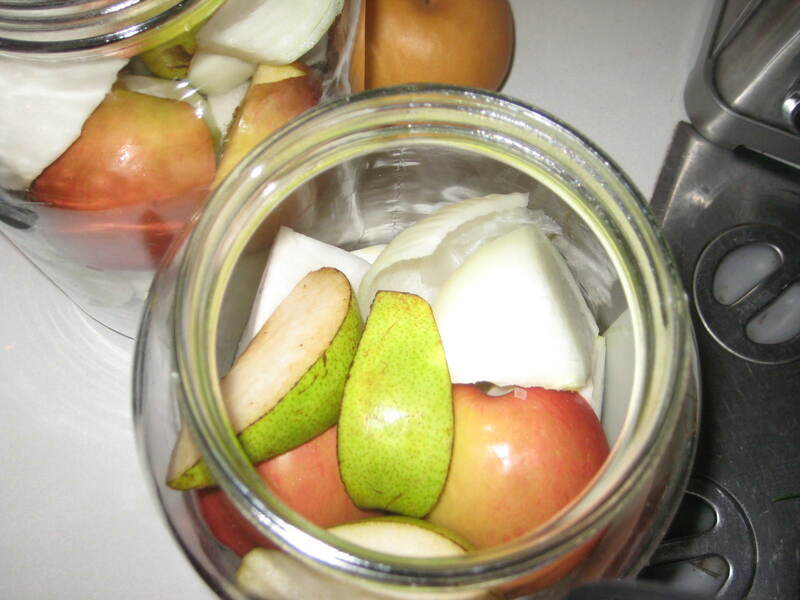 Nowadays, people get all kinds of fancy with it and add apples, pears, and other good things. 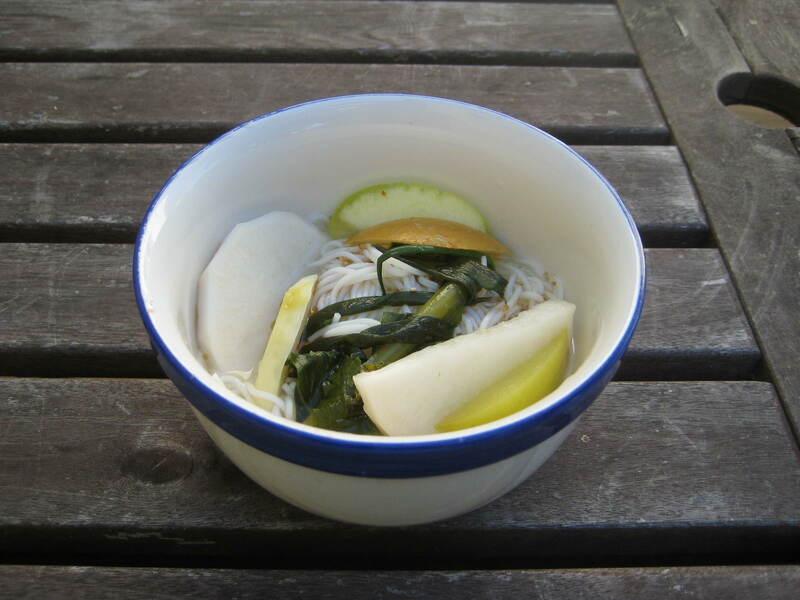 The guksu refers to the noodle aspect — some people like to add white or buckwheat noodles to a bowl of dongchimi and its watery soup. Add a dash of sesame oil, a dusting of sesame seeds and voila! A cool, light meal of divinely balanced flavors. My mom was recently inspired to make dongchimi after a friend served it for lunch with some hip new fixings. She hasn’t made her own kimchi in years so I figured I’d better take notice. Please note that dongchimi takes about a week to ripen, but it’s well worth the wait. 1. 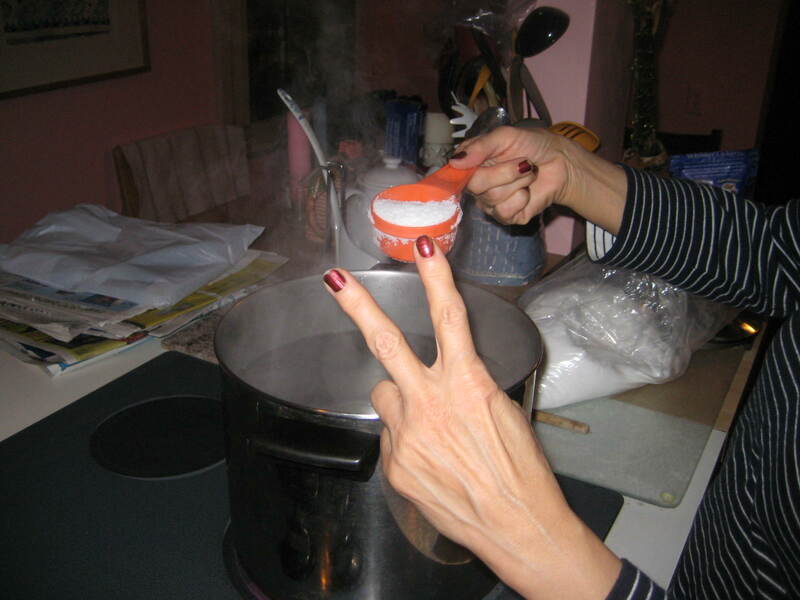 Boil a large stock pot of salt water: bring the water to a boil and then add salt and boil until the salt dissolves (my mom added 2/3 of a cup of salt to the pot below — she took to blogging right away). 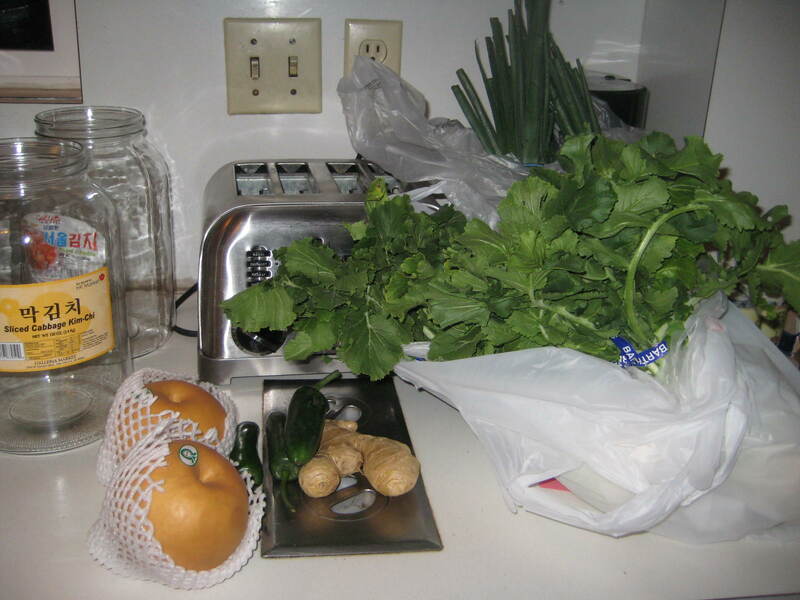 Remove from heat and allow to cool (it’s best to transfer the water out of the pot for faster cooling. We left the pot outside in the cool night air but it still took ages). 2. 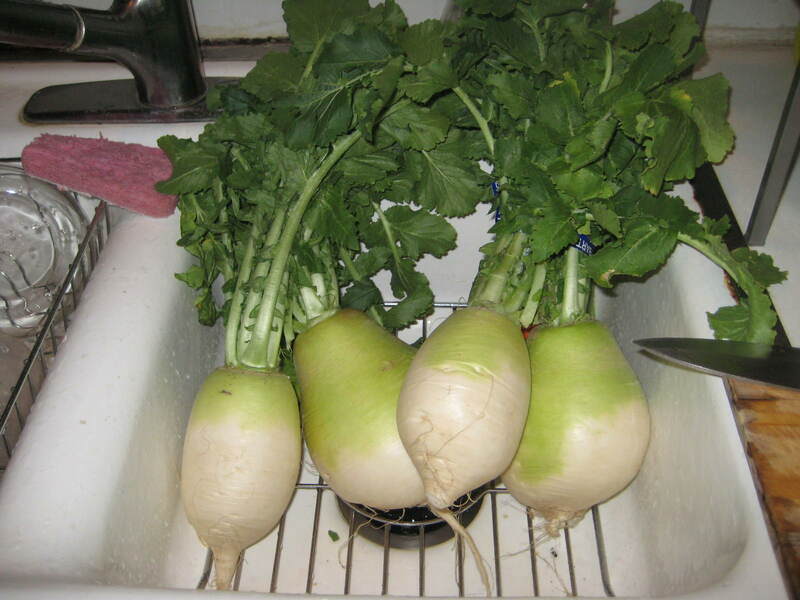 Wash the radishes and their greens carefully. 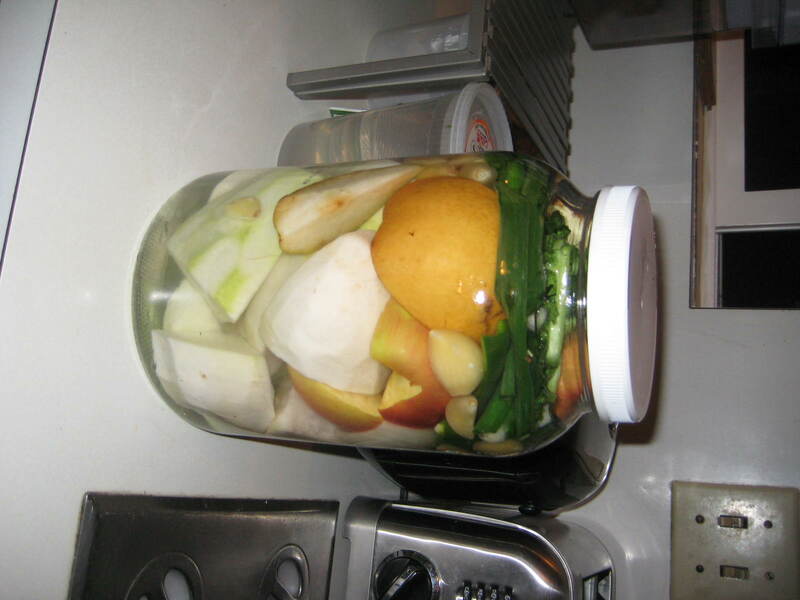 Peel the radishes and cut off the greens, reserving them. Cut the radishes into eighths or smaller. 3. 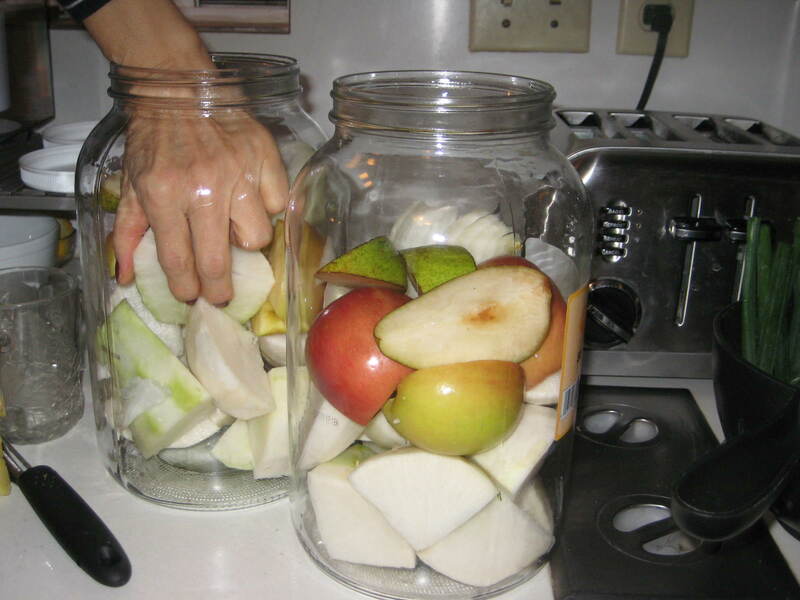 Divide the goods in half and fill each of the 2 empty jars: start by adding the radish chunks, apples and pears, then add everything else. Some people like to include the radish greens as well. 4. 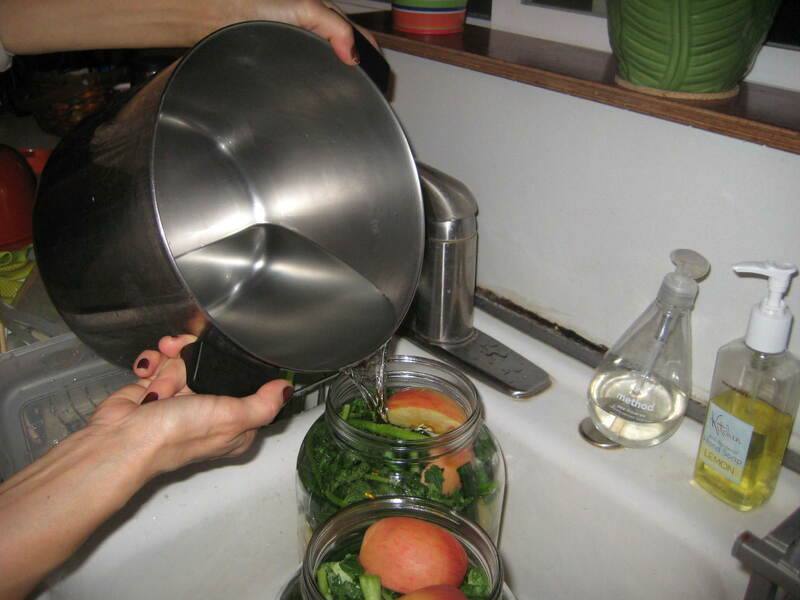 Once the salted water is cooled to room temperature, fill the jars with the water and screw on the lids. 5. 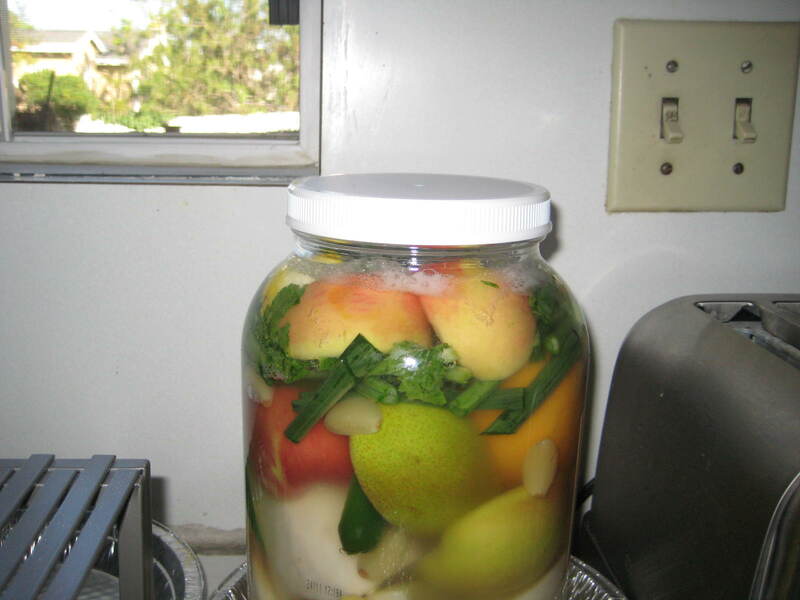 Let the jars sit out to ripen (probably away from direct sunlight). After a few days, there should be bubbles forming at the top of the jar. 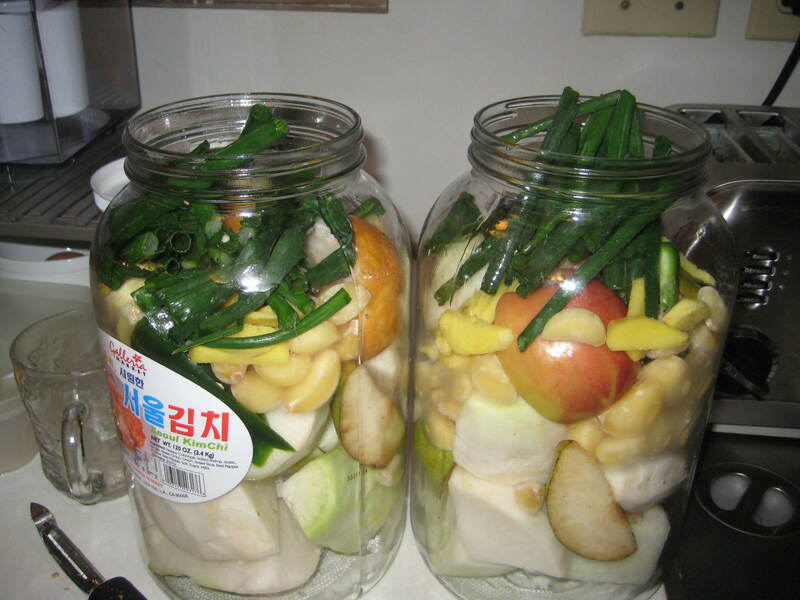 The fermenting process might cause the contents of the jar to expand and the water level to rise. If so, skim liquid off the top to keep the jars from overflowing. 7. For dongchimi guksu, prepare the somen noodles according to the package (they cook in about 5 minutes). Put a serving of noodles into a bowl and add some sliced dongchimi, fixings, and briny broth. Garnish liberally with toasted sesame seeds and add a dash of sesame oil to the bowl. Savor the way the flavors mingle — dark sesame notes, tart kimchi, sweet fruit and brine. This entry was posted in Korean, Main Dish, Side Dish and tagged dongchimi, Korean, Noodles. Bookmark the permalink.